Have you heard about tooth-colored brackets? By using ceramic to create the brackets for your braces, your orthodontist can help make straightening your teeth a less cosmetically off-putting experience. Tooth-colored brackets are harder for people to see, and can cause less irritation in the inside of your lips and cheeks than metal brackets. Their less conspicuous appearance can make them popular with adults, and image-conscious teenage patients. If it is determined that you are not the best candidate for Invisalign clear aligners, tooth-colored brackets offer another discreet form of orthodontics. While ceramic, or tooth-colored brackets use different materials for their brackets, they provide the same tension-based realignment of traditional braces. 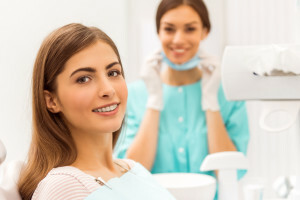 If you have issues with malocclusion (a bite that does not align, typically due to the position of your teeth), this treatment can make the necessary changes to the position of your teeth. Unlike with classic metal bracket braces, this realignment can be performed with less effect on how you look. 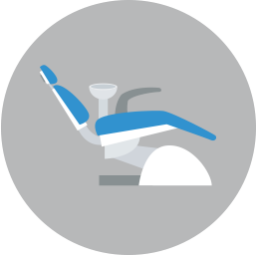 For patients who qualify, Invisalign can be a terrific way to reposition your teeth discreetly. 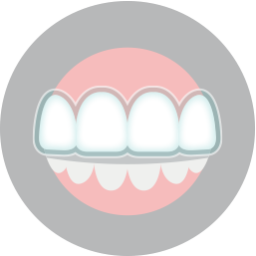 You can remove the aligners as needed, such as when you need to eat, or clean your teeth. They are made from clear plastic, so while you wear them, it can be extremely difficult to notice that they are there. Unfortunately, Invisalign is not ideal for all patients. If you are told that you are a poor candidate for Invisalign, you can look to tooth-colored brackets for your braces, so that your treatment can cause less of a cosmetic disruption.